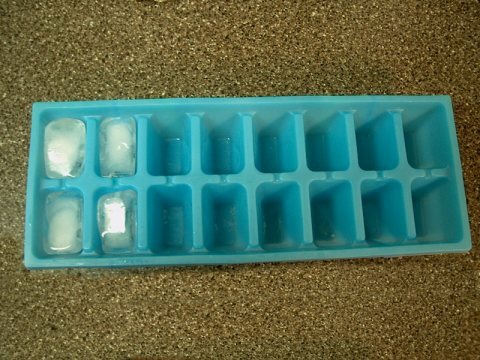 Check out this recipe for ice cubes on Food.com. Be sure to read the comments. I harvest my own free-range water, so the idea of putting it in a plastic tray and a commercially made electricity-wasting freezer disgusts me. I prefer nature’s method, waiting until the temperature outside drops below freezing. This was so simple to make and absolutely delicious. I used fresh, organic water since we’re both trying to lose weight. Since it didn’t specify how many servings the recipe would make, I doubled the recipe and actually had enough for left-overs. I’m definitely adding it to my list of favorites. This recipe might be a little too difficult for me! I once tried to make a similar recipe, but it didn’t turn out too well! That recipe was called “Iced Water”. The ingredients were, 1 drinking glass, but it didn’t state what size…ice cubes, which I didn’t know how to make…and tap water, which I don’t have access to because I’m not a tap dancer! So I don’t think I’ll be attempting to make anymore of these types of gourmet recipes!